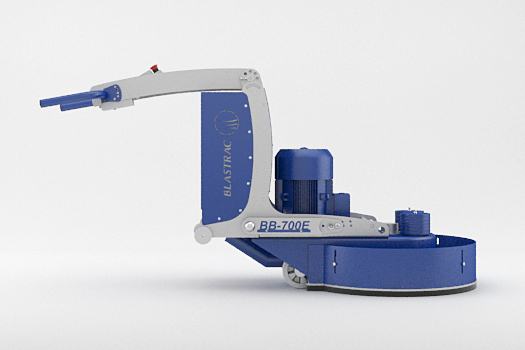 The Blastrac BB-700E is a burnisher designed for polished concrete installations & maintenance. It is equipped with an ergonomically comfortable handle in order to reduce operator fatigue. It is the perfect machine for large jobs such as airports, malls, hotels & schools. It can also be connected to a dust collector to work in a dust free environment. Blastrac provides trusted burnisher tools technology giving customers a complete solution for improving the beauty and functionality of concrete surfaces, from residential and architectural applications to commercial and industrial sites. The single grinding head allows all the pressure of the machine to be distributed onto the micro polishing pad in use. It is possible to adjust the pressure by removing weights. Blastrac developed a wide range of micro polishing pads from 200 to 3000 grit. They are extremly durable, chemical-free and can last up to 900 m². The Blastrac BB-700E is perfect for improving the beauty & functionality of concrete surfaces, fron residential & architectural applications to commercial & industrial sites.